On June 20, 2008 Ambassador John W. McDonald, Chairman and CEO of the Institute for Multi-Track Diplomacy (IMTD) visited with Mr. Jai Rup Singh, the then Vice Chancellor of the Guru Nanak Dev University, and Mr. Kuldip Singh Wadala, a local Sikh religious figure and politician, to hear about a longtime Sikh initiative that, if successful, may help to improve relations between India and Pakistan. 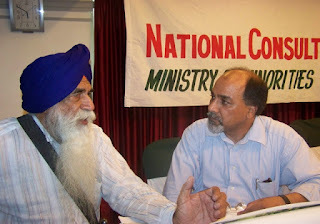 Ambassador McDonald resolved on the 20th of June, 2008 to initiate the building of an international peace corridor to link Dera Baba Nanak in India, with Kartarpur Sahib in Pakistan. 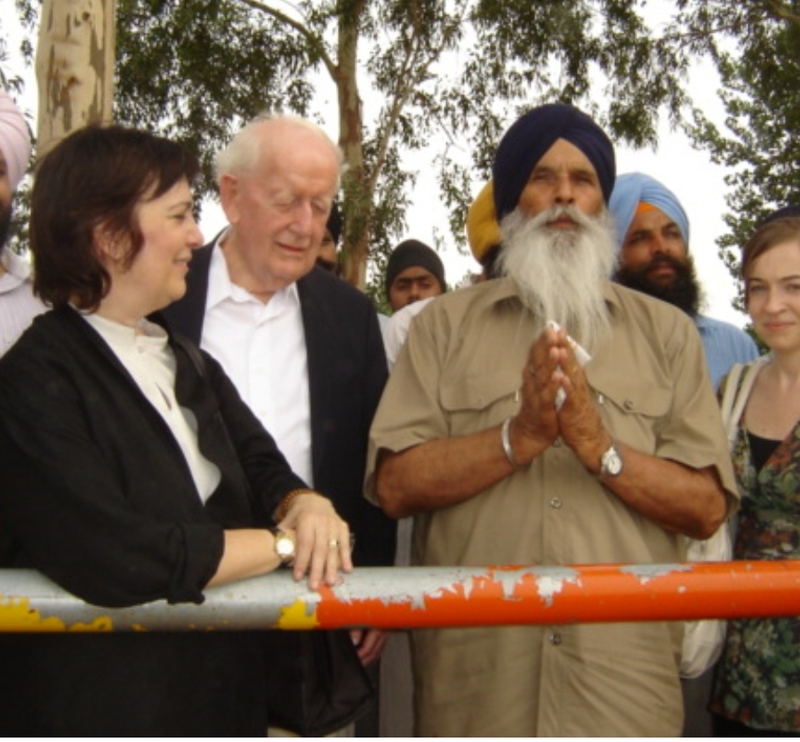 Upon returning to the United States, Ambassador McDonald learned that on June 28, 2008 the Foreign Minister of India, Pranab Mukherjee, came to the area around Dera Baba Nanak and pledged that the Indian Government would carry out a feasibility study for the Peace Corridor. Ambassador McDonald, not wanting to wait an indeterminate amount of time for the Indian Government to complete the study, decided that IMTD would carry it out. He worked on searching out potential funders for the study. Ambassador McDonald spoke to Sikh congregations for a year to raise awareness and money for the Peace Zone Project when in April 2009 Ambassador McDonald received an invitation by the Guru Nanak Foundation of America to speak to the congregation on the annual Vasahki celebration. After his speech to the sangat, Ambassador McDonald met Dr. Surinder Singh Gill. Dr. Gill facilitated Ambassador McDonald’s introduction to Mr. Rashpal Dhindsa, President of Kartarpur Sahib Marg, a Sikh non-profit group based in California. 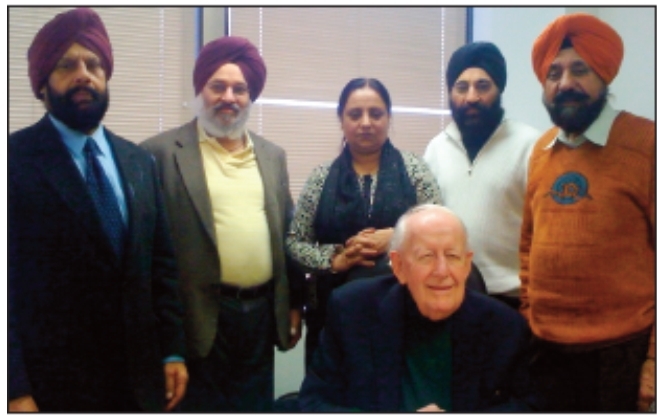 Mr. Dhindsa invited Ambassador McDonald to visit them in Ontario, California so the Ambassador could address the sangat there and discuss IMTD’s plan to have the corridor built. Before Ambassador McDonald embarked on the trip the decision was made to form a five-member committee made up of Sikhs who have spent many years in the service of their community. They included, Mr. Surinder Pal Singh, Mr. Gurcharan Singh, Mr. Rashpal Dhindsa, Mr. Amar Singh Malhi, and Mr. Avtar Singh Pannu. The trip to California and the Riverside Gurudwara was a huge success. The Sikh Sangat made individual pledges totaling $60,000. This boon to the project would pay for the entire feasibility study. With the study in hand, the Institute and Ambassador McDonald can present the findings to the Indian and Pakistani governments to give the corridor their official backing. Ambassador McDonald was now in a position to deliver the first financial installment to IMTD architect and South Asia Regional Director, Syed Azmat Ali Zaidi. Mr. Zaidi is an accomplished architect who was a former Vice Chairman of the Institute of Architects, Pakistan. While awaiting the official permission of the Pakistani military for the physical survey of the area, Mr. Zaidi has been busy laying the groundwork for a full-scale engineering project that will eventually traverse the Indo-Pak border. In order to do so Mr. Zaidi has liaised with many official, religious, and NGO figures in Pakistan to facilitate the clearances and licenses necessary for a project of this magnitude. Meanwhile, IMTD has made contact with a prominent Sikh civil and structural engineer. Mr. Surinder Singh is President and CEO of EMC2 Inc, a Maryland based engineering consultancy that has many prominent contracts currently being worked on in the D.C. Metro area. He has offered his services on the Kartarpur Project free of charge. Mr. Singh and Mr. Zaidi have recently met in Lahore where they discussed, along with Kartarpur Sahib caretaker, Veer Ji how the survey, study, and corridor will be shaped going forward. Veer Ji was generous with his time and gave the two professional gentlemen a walk-through of the holy site. Mr. Surinder Singh has done a remarkable job traversing the border and visiting many of the holiest sites in Sikhism in just three days. In a whirlwind tour of the sites, thanks to the support of Mr. Zaidi and Veer Ji, Mr. Singh now has ample information to make a schematic based on his visit. 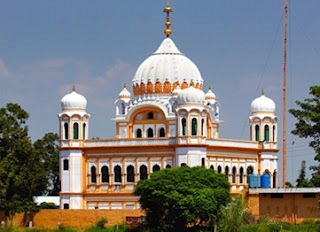 By the end of February, Mr. Singh hopes to have a tentative feasibility study done for a corridor connecting Kartarpur Sahib and Dera Baba Nanak. The study will include a displays of how the road will be laid out, how security will be implemented, and detail the infrastructure required to support a corridor of this nature. Once the study has been finalized, Ambassador McDonald will present it to the Indian and Pakistani Ambassadors here in Washington D.C. so that they would send it back to their respective capitals for approval. Right now, IMTD and the Executive Committee could use assistance in finding some contacts within the Indian and Pakistani armies to review our study, once complete, so that they can review the security measures our engineer has laid out, and augment any specific features, if necessary. With this kind of consolation, we feel the study will hold more legitimacy with the Indian government whose foremost concern is security. Any help our Sikh brothers in India and Pakistan can give in this regard would be must appreciated.